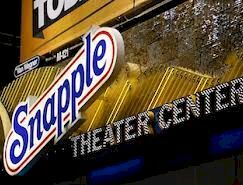 The The Theater Center, which opened in 2006, is a multi-theater entertainment complex located on the corner of 50th Street and Broadway. It is a 20,000-square-foot state of the art entertainment center consisting of two theaters with a total seating capacity of 398, rehearsal studios, contemporary lobbies, WiFi, two bars with cabaret-style seating and two merchandise stands. The The Theater Center is one of the top New York City venues for concerts and other events. Don't miss some of the biggest names in music as they come to New York City area's The Theater Center to perform live.